Just to clear the air for you, this is NOT an Asian film. I thought the same thing when I first saw the poster. The main language of this film is English, with a bit of Chinese and Japanese dialogues. Not to worry though, there’re official subtitles. 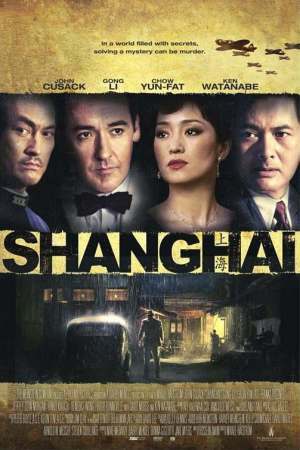 Anyway, the movie is focuses on Paul Soames (John Cusack), an American man who goes to Shanghai to investigate on his friend’s death. He discovers larger conspiracies and secrets along the way. The timeline of the storyline is set in 1941. To write a script with three or more different languages is certainly not an easy task, but personally I think this one is pretty well written. Sure, the movie is dull and would require a lot of effort to watch but it’s really intriguing nonetheless. While I watching, I have to admit, I was seriously doubting that the movie has any purpose at all. But the message becomes pretty clear at the end. I was also impressed by how they still managed to shoot the entire film so well in Bangkok, Thailand after their permit to shoot in China was taken away just one week prior to their when their filming was scheduled to start. On top of all that, the director, Mikail Hafstrom, usually only directs or/and writes for horror films and to have pulled this off so decently certainly deserves my respect. Perhaps the biggest let downs of this movie are the performances of John Cusack and Chow Yun Fatt. Johnny Depp was apparently interested to play Soames and I believe he could’ve provided the charm that Cusack lacked of for the role. Chow played Anthony Lan-Ting, a triad boss. Considerably a small role compared to his others in past and yet he did not deliver. The role of Lan-Ting’s wife, Anna, is played by Gong Li and I think she did absolutely brilliantly. Not to mention about how gorgeous she looks. FYI, she’s in her mid 40s. It’s incredible. Verdict: Many might find this film “lan ting” (difficult to tolerate) due its slow pace, complications and dullness but I find its plot and style quite unique. And the moral of the story is..? (Spoiler begins here) 1- Everyone makes mistakes no matter how competent one may seem to be. 2- Love and secret affairs are very complicating and agonising. At least one side would suffer the consequences in the end. 3- Do not jump to conclusions (Spoiler ends here). The Lan-Tings: Anna and Anthony are both Chinese but why do they still call each other by their English names even when they’re speaking to each other privately? To add to my curiousity, does their surname even exist? Cause’ I haven’t heard of anyone who goes by that.